Our family travelled to Phuket in 2008. We stayed at the Sheraton Grande on Bangtao Beach. The resort was a great place to stay as we were traveling with the kids. The kids still talk about our holiday, there was just so much for them to do. 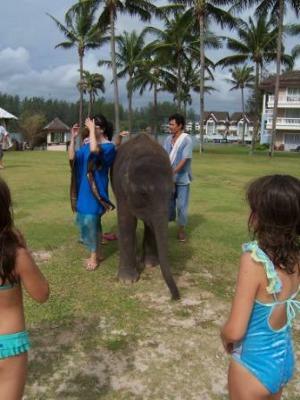 One of the highlights for our kids was seeing the baby elephants walking throughout the resort and playing on the beach. Absolutely priceless and we can't wait to return. So happy to hear that you and your family had a wonderful holiday and enjoyed the resort. Our kids loved the baby elephants too. In case you weren't aware the Sheraton is under new ownership and it now called the Angsana Laguna Phuket. Join in and write your own page! It's easy to do. How? Simply click here to return to Do you have a favorite Resort.